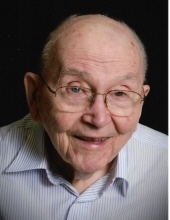 George W. Taylor, 92, of Wilmington, died Thursday, January 17, 2019 at Heartland Hospice House, Wilmington. Born in Red Lion, PA, he was the son of the late William E. and Beulah G. Sheffer Taylor. George was the husband of the late Laura Schoener Taylor with whom he shared 62 years of marriage before her death in August 2012. After graduating in 1948 from the United States Merchant Marine Academy at Kings Point, George began his engineering career traveling around the world with the Sun Oil Company. After the birth of twin daughters and with the strong urging of his wife, he began a long career with DuPont primarily at the Edge Moor Pigment Plant retiring in 1985. He was a longtime and active member of St. Mark’s Lutheran Church. George was a member of Brandywine Lodge #33 A.F. & A.M. and Naomi Chapter #20 Order of the Eastern Star. He was the Past Patron of Brandywine Chapter #14 and Past Grand Patron of the Order. He was a Past Associate Grand Guardian of the International Order of Job’s Daughters. George volunteered over 10,000 hours at the Christiana Care Wilmington Hospital. He was an avid woodworker. George enjoyed spending time with his family and gatherings with the Taylor Clan. George is survived by a son James (Joye) of West Sadsbury, PA and three daughters; Adele Taylor, Barbara Melvin (David) and Susan Shustack Marge all of Wilmington. He is also survived by 10 grandchildren: Erin Warfel (Wyatt), Brendan Taylor (Erin), Sara Kenna (Andrew), Jennifer Bowen (John), Kirstin McElroy (Patrick), Stephanie Chandler (Scott), Caitlin Braun (Steve), Gretchen Paulson (Ben), Emily Kountourzis (Adam) and Molly Shustack and 13 great grandchildren: Julius, Ashlyn, Brayden, Elye, Sophia, Natalie, Syrus, Evelyn, Addison, Nora, Mason, Avery and Liam. George is also survived by 2 sisters: Jane Miller and Mary Lou McFarland and a brother Bill S. Taylor all of York, PA and many nieces and nephews. In addition to his wife and parents, George is predeceased by a brother, Robert S. Taylor and a son-in-law, Roy Marge. A Memorial Service for George will be held on Monday, January 28, 2019 at 11 am at St. Mark’s Lutheran Church. There will be a Masonic Service beginning at 10:45am. Family and friends may visit from 9:30-10:45am. Interment will be in Christ Lutheran Church Cemetery, Stouchsburg, PA.
Memorials in George’s honor may be made to St. Mark’s Lutheran Church, 501 Duncan Road, Wilmington, DE 19809. To send flowers or a remembrance gift to the family of George Warren Taylor, please visit our Tribute Store. "Email Address" would like to share the life celebration of George Warren Taylor. Click on the "link" to go to share a favorite memory or leave a condolence message for the family.